As the international community applauds the presidents of Armenia and Turkey for making unprecedented progress in attempts to normalize relations, others are not so ecstatic. Indeed, while many consider the establishment of diplomatic relations and the opening of borders between the two estranged neighbours as crucial in establishing peace and stability in the region, opposition to such a development was always going to materialize from some political forces within Armenia as well as its other foe, Turkish ally Azerbaijan. But, if yesterday’s rally to mark the declaration of independence in the disputed territory of Nagorno Karabakh staged by the Armenian Revolutionary Federation — Dashnaktsutyun (ARF-D) was anything to go by, such fears might be overblown in Armenia, at least. Armenia and Azerbaijan fought a war over Karabakh in the early 90s leaving around 30,000 dead, a million diplaced from their former homes, and Armenian forces in control of over 14 percent of Azerbaijani territory. It came as no surprise, therefore, to discover that the anniversary event would also be used not only to protest the recently announced protocols which could end a century-old rift, but also to voice its displeasure with what many consider might be a parallel process to finally resolve the dispute over Karabakh. Despite having both issues central its ideology, however, the nationalist party failed to attract more than 500 people. Having resigned from the coalition government in April specifically because of reported progress in attempts to mend ties between Armenia and Turkey, the party now lacks the administrative resources necessary to mobilize people onto the streets. Last year, for example, the same event which preceded the arrival of Turkish president Abdullah Gul in Yerevan by just a few weeks, the ARF-D managed to attract a few thousand. Many, however, allege that most of those in attendance were schoolchildren bused in to the event by their teachers. At that time, the ARF-D hwas responsible for the Ministry of Education. Billed to last two hours, the rally ended half an hour with most of those attending talking among themselves rather than listen to speeches accusing the government of "selling out" historical demands under the pressure of the international community. Calling once more for the resignation of the Armenian foreign minister, Eduard Nalbandian, they once again stopped short of demanding that the president, Serge Sargsyan, step down. “As long as there is a possibility of preventing the signing of a final agreement […], such a demand can not be logical,” RFE/RL quoted head of the party’s governing body as saying. Whatever the politicians might say, however, noody is sure of how society will eventually consider the proposed protocol. During photographic work conducted for The National newspaper in June, for example, one genocide survivor was most adamant that ties should not be mended until Turkey owns up to its past. In villages such as Ashnak in the country’s Aragatsotn region, similar views could also be heard, but while fixing for the BBC in other parts of the country, and especially on the border with Turkey itself, the tone was more conciliatory. "The prospect of a border opening is not only a personal issue. It will help everyone. We want to become friends with the Turkish people – they are our neighbours," [Gharnik Kharibyan] says. 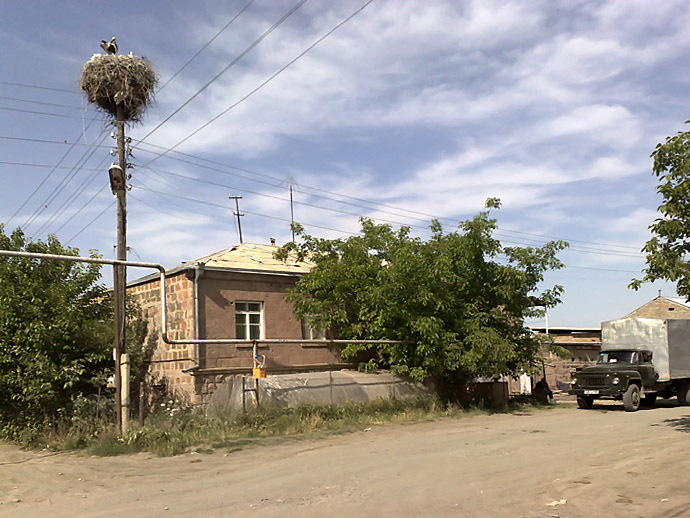 […] some Margara residents, like Sonik Ghazaryan, still have concerns – even though now she is prepared to move on. "We are very sensitive about this issue because we remember the stories [about the killings] our ancestors told us," she said. Even so, certain forces within Armenia continue to criticize any possible rapprochement between Armenia and Turkey. Opposition supporters argue that it betrays the country’s interests while nationalists panic in the understanding that recognition of the border would put end to territorial claims on its Western neighbour once and for all. Both also claim that the protocols will have negative implications for resolution of the Nagorno Karabakh conflict, something which. Independent analysts, and as well as one western diplomat talking to Frontline, refute. Meanwhile, the extra-parliamentary opposition led by Levon Ter-Petrossian welcomes moves to normalize relations between Armenia and Turkey, but opposes the establishment of a historical commission to look into the events of 1915 arguing that it "calls into question the reality of the Armenian genocide." Ironically, one of their main figures, former Foreign Minister Alexander Arzumanian, was accused of doing the same in 1991 when he was part of the now defunct Turkish Armenian Reconciliation Commission (TARC). Nevertheless, Ter-Petrossian’s Armenian National Congress (ANC) is believed to be less negative towards developments as some initially believed, leading to news of some divisions within. The country’s largest opposition force, the Armenian National Congress (HAK), has responded more positively to the latest developments in the more than yearlong Turkish-Armenian negotiations. In a statement issued on Tuesday, the HAK said the disclosed draft protocols mark “substantial progress” towards Turkish-Armenian reconciliation. It at the same time denounced the planned creation of a Turkish-Armenian body tasked with examining the World War One-era massacres. However, with both sides teaching their own sometimes selective and incomplete accounts of the past, some Armenian historians such as London-based Ara Sarafian believes that such a commission could be useful if conducted and monitored correctly. He also says that just as unfettered access to key documents in the Ottoman Archives is vital, so too is access to records kept in the Armenian Diaspora. There is no doubt about the veracity of the claims of genocide, the scholar says, but there is still much to be studied. Nevertheless, the parliamentary opposition Heritage party also seems hell bent on turning the matter into a vote of no confidence in the Armenian president. Note only were some of its members present at yesterday’s ARF-D rally, but the nationalist-leaning party issued a statement posted today calling for the collection of signatures to force a national referendum on the matter. The party is known for its opposition to any talk of concession to Azerbaijan and Turkey even in the interest of peace. More alarming, perhaps, some civil society groups are more outspoken. Today, for example, A1 Plus reported that the Institute for Democracy and Human Rights (IDHR), has even resorted to what some might interpret as direct threats to anyone who supports the protocols. Individual members of Heritage as well as nationalist activists such as former Karabakh commander Zhirayr Sefilian have also made implied similar threats in recent months. For now, however, the international community can probably breathe easy given that there is no sign of such groups commading significant support in society. Moreoever, for now all eyes are on Anakara and Baku rather than Yerevan. Many diplomats agree, believing that many Armenians would rather look to the future; honouring the past rather remaining isolated and economically crippled because of it. Fresh back from a tour of the region when he examined such issues, regional analyst Kevork Oskanian agrees and today offered his opinion on the protocols on his specialist blog. Many Armenians in Armenia and Nagorno-Karabakh are tired of being put at the service of ideological utopias, be they communist or nationalist. What they want is what everyone wants – security and prosperity, for themselves and their children. […] They lived 70 years pursuing a worker’s paradise and won’t waste the next generations limiting their options by trying to attain another pipedream, and that is their full right. 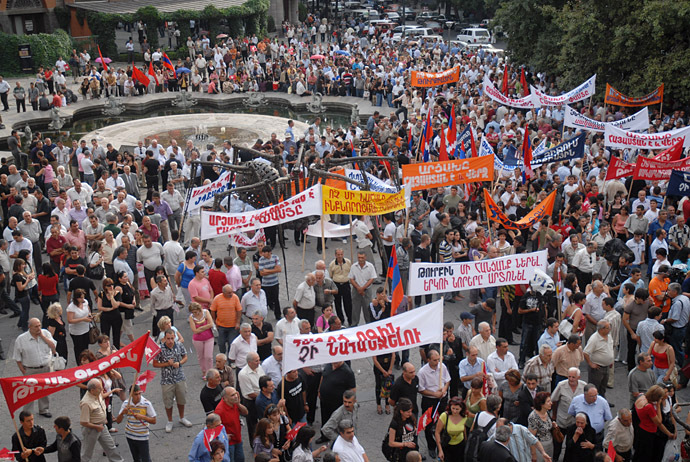 These are the real reasons behind the tiny ARF demo and the muted HAK statement in Yerevan. Whether the same can be said in six weeks time, however, remains to be seen. For now, what will determine whether the protocols to normalize relations will be accepted or now is the mood in Azerbaijan and Turkey. Speaking to Frontline, one diplomat remains cautiously optimistic about a breakthrough, and perhaps even an accompanying one to end the long-running conflict between Armenia and Azerbaijan over Nagorno Karabakh. However, nothing is certain, and many obstacles lie ahead. More updates as of when.